Please add $10 for shipping, handling, & insurance. Jesus will meet a person wherever he or she cries out to Him. The love of God will reach to our lowest hell. 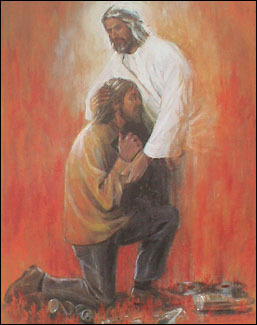 This portrayal of a drug addict and alcoholic repenting at the feet of Christ is a powerful picture of the forgiveness and acceptance extended to every person because of the cross. View this artist's other paintings! Repentance copyright© 1977 by Beth Sweigard is prohibited from being copied. All applicable copyright© laws apply and are reserved by artist Beth Sweigard. Web pages copyright© 1998-2015 by Christ-Centered Mall, Inc. All Rights Reserved.